Facial lines and wrinkles are caused by a gradual breakdown of the body’s collagen and elastic fibers in the skin. Smiling, squinting, and frowning are just a few of the movements that inflict stress on the underlying collagen in our skin, accelerating the formation of furrows and wrinkles. In recent years, injectable collagen was the most widely used cosmetic filler available, until science gave us a better alternative: Juvéderm®®. Juvéderm® is a next-generation, non-animal filler that creates a natural look, with results lasting up to twelve months or longer. Juvéderm® is the only dermal filler currently available with the highest concentration of hyaluronic acid and a special formulation process. Discover what Juvéderm® can do for you with a complimentary consultation. Why Choose Juvéderm® Brand Dermal Fillers? Juvéderm® smooths and plumps deep facial wrinkles and creases, as well as the finer lines around the mouth and eyes; it can also be used to augment the lips safely. The results of your Juvéderm® treatments are immediately noticeable, thus allowing your doctor to determine if an additional injection is needed. Juvéderm® offers the same cosmetic benefits provided by animal-based hyaluronic acid skin fillers but without the risk of allergic reaction. Adding volume and hydration, Juvéderm® creates a smooth and youthful-looking facial appearance that can last up to one year. Why Does Juvéderm® Come in Multiple Formulations? Juvéderm® is available in several formulations, allowing your physician to tailor a treatment to your unique needs. Juvéderm® Ultra provides versatility in contouring and volumizing facial wrinkles and folds while Juvéderm® Ultra Plus is a more robust formulation for correcting deeper folds and wrinkles. Both Ultra and Ultra Plus contain 24 mg/ml of hyaluronic acid, but Ultra Plus has a higher proportion of cross-linking than the Ultra formulation. Juvéderm® contains the highest degree of cross-linking of any of the hyaluronic acid fillers, delivering a smooth consistency. In 2010, both Ultra and Ultra Plus became available with lidocaine, to reduce pain with injection. This injectable gel dermal filler is the first and only filler FDA-approved for patients over the age of 21 to add volume to the cheek area instantly. It gives you a visible lift, helping to restore a young-looking contour to the face. While primarily used on older patients, younger patients who feel that their cheeks are too flat are also candidates for Voluma. 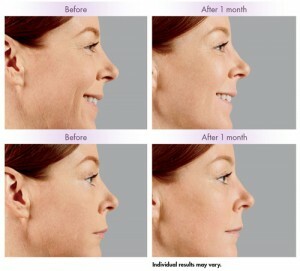 Voluma specifically adds volume to the apex, the apple, and the hollow of the cheeks. If you experience loss of volume in the lower face and midface, Vollure may be recommended to meet your needs. This version of the Juvéderm® filler is specifically formulated for mild to severe parenthesis lines: the wrinkles that form at the sides of the mouth and up toward your nose also called laugh lines or nasolabial lines. Patients enjoy results from this injectable for well over a year, making touch-ups easy and convenient. This is a common area of complaint, and Juvéderm® Vollure XC has been shown to fill and smooth facial lines around the nose and mouth, with lasting, beautiful results. The same-cross linking technology used in Juvéderm®’s other brand of fillers is built into Vollure, making it a sought-after and effective filler for the lower face. Vollure is lighter in density than Voluma, mentioned above, and can move dynamically with facial expressions, so you never look over-treated or stiff. Injectable treatments are relatively pain-free, and a prescription numbing cream is available before the injection if patients feel any anxiety about their treatments. The injection process takes approximately 15 to 30 minutes, and the results are immediate. You should also allow time to consult with your doctor or nurse before treatment. If you choose topical numbing, we recommend you allow an additional 30 to 60 minutes. Juvéderm® is injected into the area to be treated and can be smoothed or sculpted after injection, which results in a natural look. The skill of your injector is vital for a natural-looking result. At Comprehensive Dermatology Center of Pasadena, we have many years of experience with Juvéderm® dermal fillers. We know how these products work in the skin and can recommend a combination of fillers to deliver your desired look. Side effects are rare but may include minor bruising or swelling which usually subside within 24 to 48 hours. The effects of treatment are noticeable immediately, and normal activities can be resumed as soon as the treatment is completed. Any minor bruising or redness occurring at the injection site can easily be corrected with makeup. Injections may cause some discomfort, but the smooth consistency gel of Juvéderm® allows your doctor or nurse to administer it easily. You can return to work and other normal activities immediately after your Juvéderm® Voluma appointment. However, you can expect some mild side effects for two to four weeks. These include minor bruising, swelling, redness, tenderness, itching, and lumps or bumps at the injection sites. Almost everyone is an excellent candidate for hyaluronic acid dermal fillers, as they have been proven safe and effective on patients of all skin types, ethnicities, and all ages. Juvéderm® should not be used by women who are pregnant or breastfeeding or patients with weakened immune systems. The juvéderm ® filler may be a good option for patients who wish to fill in deep folds or creases in the face, or for those who would like to augment their lips. Juvéderm® is also effective on fine lines around the eyes. At Comprehensive Dermatology of Pasadena, we offer Juvéderm® as a customized procedure based on individual needs so costs will vary for each patient. We sell Juvéderm® products by the syringe. The number of syringes required for the maximum result will be discussed during your consultation. What Can Juvéderm® Do for Me? Juvéderm® is a long-lasting wrinkle filler, but it is not permanent. In many patients, the results last up to two years. This depends on the type of filler used, treatment areas, and the patient’s unique biology. Juvéderm® is an FDA-approved treatment program that uses a crystal-clear gel to produce a smooth, youthful appearance. It is used to fill wrinkles and enhance lips made from a naturally occurring substance that lives in all living things. Hyaluronic acid already occurs naturally in human skin, and the hyaluronic acid that is used in Juvéderm® is created through biosynthesis and is not of animal origin, so it is highly biocompatible.